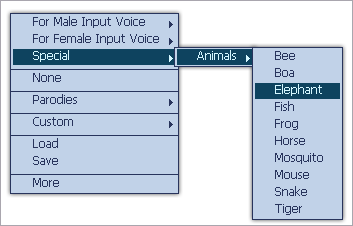 To change a song or create a recording sound like animal sound is too easy with the help of voice changer software. And if you are looking for one, AV Voice Changer Software Diamond is the best choice for you! AV Voice Changer Software is an advanced voice adjusting tool which works on AVVirtual Audio Driver mode. This working method allows users to change their voice while chatting with any IM and VoIP applications in real time. Timbre and pitch which are the most important qualities of a human's voice can now be changed smoothly with the help of Timbre and Pitch graph (also called Voice Morpher graph). With ready-to-use sample output voices, you can achieve your target voice in just one click away. This is a great help to save user's time morphing and discovering this masterful program.